Roffey climbed up to second in the Sussex League Premier Division with a eight-wicket win against Bexhill at the Polgrove yesterday. The reigning champions won the toss and inserted their hosts who scored 168 all out as Shawn Johnson top-scored with 65. George Fleming was in fine form with the ball as he claimed 7-72 from 28 overs, before Theo Rivers hit an unbeaten 126-ball 91 and Rohit Jagota hit 63 not out as they won at a canter with 172-2. They leapfrogged Preston Nomads whose game at Horsham was abandoned without play owing to an unfit square at Cricketfield Road. East Grinstead continue to lead the way at the top as they eased to a 142-run victory at the Nevill Sports Ground against Brighton & Hove. The pace setters posted 229-6 in their 58 overs after losing the toss and being inserted as Will Adkin and Leo Cammish both hit half centuries. Ian Sturmer and Craig Fowle then both took three wickets as they bowled Brighton out for 87. Basement side Middleton recorded a shock 83-run victory against Billingshurst at the Jubilee Fields. Sean Heather’s side scored 147 after losing the toss as Jofra Archer against proved a thorn in Hurst’s side. 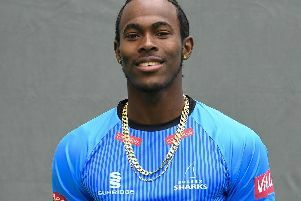 He top-scored with 72 as one of only three batsmen to make double figures in Middleton’s innings as Abi Sakande claimed 6-34. Chris Liddle (11) and Will Fazakerley (12) were then the only scores of note as Billingshurst crumbled to 64 all out. With the ball, Brandon Hanley recorded figures of 6-15 from 11 overs. Lowley Eastbourne also won - they overcame Cuckfield by 47 runs. Eastbourne batting first having lost the toss scored 215, before their visitors managed just 168. Division 2 leaders Lindfield were beaten by three wickets at home by Pagham. Opener Chris Sawyer scored 65 in their total of 197 after the hosts won the toss and elected to bat. Pagham captain Joe Turner then top-scored with 60 as they crept to victory with 199-7. Worthing closed the gap on the leaders to just five points with their six-wicket triumph at Three Bridges. The home side scored 149 after being put into bat and Sam Delaney’s 68 helped Worthing home with 150-4 in 25.1 overs. Hastings & St Leonards Priory beat Ifield by 100 runs at Hontye Park. John Morgan’s side put on 180 after winning the toss with Joe Billings (60) and Jake Woolley (56*) the stand-out scorers. Guru Kedarnath took 6-68 with the ball, but Ifield were then bowled out for 80 despite lasting 37.3 overs. Hastings’ Adam Barton took a staggering 8-24 from 12 overs. Findon and Ansty drew at Long Furlong after Ansty scored 197-8 and Findon replied with 136-8. St James’s Motefiore posted 209-8 declared in 47 overs before bowling Crowhurst Park out for 135 to record a 74-run victory. Division 3 leaders Bognor secured promotion despite being held to a draw by Chichester Priory Park in the division’s big derby clash at Priory Park. Simon Hasted hit an unbeaten 120 for Chichester along with Ben Caldera’s 84 in their total of 251-4 declared after 52 overs. Bognor then replied with 192-7 as Matthew Geffen took three wickets. In the other derby match, Haywards Heath pulled off a shock win 46-run against Burgess Hill at St Johns Park. Chris Blunt hit a half century in Heath’s 154 before third-placed Burgess Hill scored just 108 all out. Portslade beat bottom club Glynde & Beddingham by 53 runs at the Benfield Valley Pavilion. Paul Glover’s side scored 197-3, while the visitors replied with 140 all out. Goring overcame second-bottom Rottingdean by 49 runs thanks to six wickets from Matt Keen. Keen helped bowl Rottingdean out for 99 after Goring, batting first having lost the toss, scored 148-9 in their 53 overs. Second-placed Crawley Eagles secured a six-wicket win away to Steyning. Ben Shelford scored 65 for Steyning in their total of 210, before an unbeaten 106 from Rehan Hasan saw Crawley home with 213-4. Division 4 leaders Mayfield secured promotion and heaped more misery on basement side Wisborough Green with a comprehensive nine-wicket win at the Wellbrook Ground. Wisborough scored an embarrassing 25 all out after winning the toss and opting to bat as Marno Pretorius took 7-13 including a hat-trick. Mayfield then eased home with 26-1 needing only 21 deliveries to do so. Crawley and Stirlands played out a draw at Southgate Park. The hosts, batting first after losing the toss, scored 213 all out in 51 overs, before Stirlands replied with 143-8 . Crawley captain Harry Chaudhary took 6-52, but his side failed to clinch the final two wickets for the victory. Hellingly boosted their chances of beating relegation with a 15-run victory over Keymer & Hassocks. Captain James Pooley scored 103 in Hellingly’s 165, before his side bowled out Keymer for 150. Southwater’s home game against Rye and Henfield’s derby with Slinfold were both cancelled due to unfit squares due to the heavy rain on Friday.